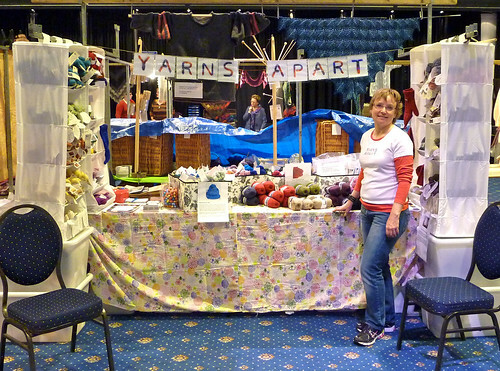 This last Friday and Saturday, April 1-2, Yarns Apart participated in our first market! This was the Breidag in Nieuwegein. We set up Thursday night and were ready to open shop Friday morning. It was so much fun! There were 40 shops set up in the big meeting hall. There were classes held all day long, both days. There was a table set up for “Pattern Doctors”. There were people meeting up everywhere, some for the first time, some old friends going way back. Everyone was there because they love knitting and crochet. It was much better than the Handwerkbeurs because it was so focused. On Friday afternoon Nancy gave her Beginning Brioche class and I was her assistant. There were 24 people in the class so having an assistant was almost a requirement! It was so fun to help teach brioche knitting, which I have really fallen in love with. Maybe we will do this again soon…. I don’t know yet where or when Yarns Apart will appear in person again, but I hope sooner rather than later. The Breidag has given me so much energy and enthusiasm to continue to bring you the best yarns in the world! Looks great, as do you. Hope you did well and had a fab time. Look forward to seeing you at the S’n’B in less than 6 weeks! !